Red Cross and Oceana look professionally designed, SDLO looks like it was created with a blog template. Some of the sites have a motto or tagline on the banner and some do not. Some of the sites make clear the charity’s purpose with clear menu headings and headlines, some do not. Each site offers different social media options on different places on the page, sized and designed in various ways. Its design is unprofessional (it looks like it is created from a blog template) which does not inspire trust in Jane. There aren’t many pictures or first person accounts of the students helped by the charity, which does not impress her. It is not clear to Jane who the charity helps and what it does. The “About us” link does not explain what the charity does, as Jane expected, but rather provides biographies of the staff. The brief descriptions of SDLO programs under the “Students” tab don’t provide any information about how Jane can get involved. The Support Us tab has very little information about donations, and no mechanism for donating online; it just provides an e-mail alias. The social media options allow Jane to “like” the charity, but it is unclear whether it has a source of social media information like a Twitter stream or Facebook page. The design is professional, well-organized, and provides clear categories, sufficient details, pictures, and supporting documents to help Jane’s research. The “About us” link provides clear and detailed information about the charity’s mission, including supporting documents. It is obvious how to donate; there is a large button on the home page and an easy, informative way to donate online. 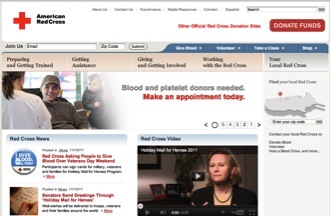 A prominent “Giving and getting involved” link tells Jane that she can donate, volunteer, give blood, or consider becoming an employee, and provides links to each type of assistance with instructions on how to get started. Links to several social media channels give Jane a direct connection to social media discussions about the charity. The About us link, like Red Cross, provides clear and detailed information about the charity’s mission, including supporting documents. 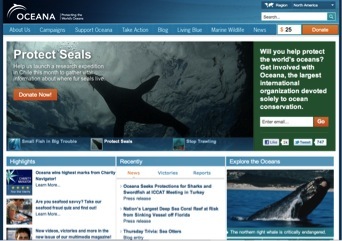 The site provides extensive and attractively-designed research information about endangered animals and the charity’s work with them, so Jane can learn specifically how Oceana helps. Particularly the beautiful photographs inspire her interest and sympathy. The prominent Take Action link provides a direct link to a petition about a specific animal welfare issue, making it easy to help in a specific way. Prominent “Donate now” buttons make it clear how to contribute, and there is a web form that makes this easy. Oceana has a Facebook page and Twitter stream that are easy to find near the lower part of the home page, if she wants to hear what other people are saying about the charity. The persona/scenario section does not provide enough information to use as a basis for analysis. Tasks are usually more concrete -> “how to donate” isn’t a task, the task is something like “Sam wants to donate $25 using his credit card or Helen wants to volunteer one weekend a month.” How might you rephrase ” What the charity does and who it helps” to be a task?